KFB Candid Conversations presents a discussion about the topical issues facing the agricultural industry in a question and answer format with a member of Kentucky’s agricultural community. In this column, Chad Lee, Director of the University of Kentucky (UK) Grain & Forage Center of Excellence discusses the expansion of the Center and the advantages that will come from its research efforts. The facility is part of the UK Research and Education Center located in Princeton, Kentucky and support for its funding was one of KFB’s 2016 priority issues. 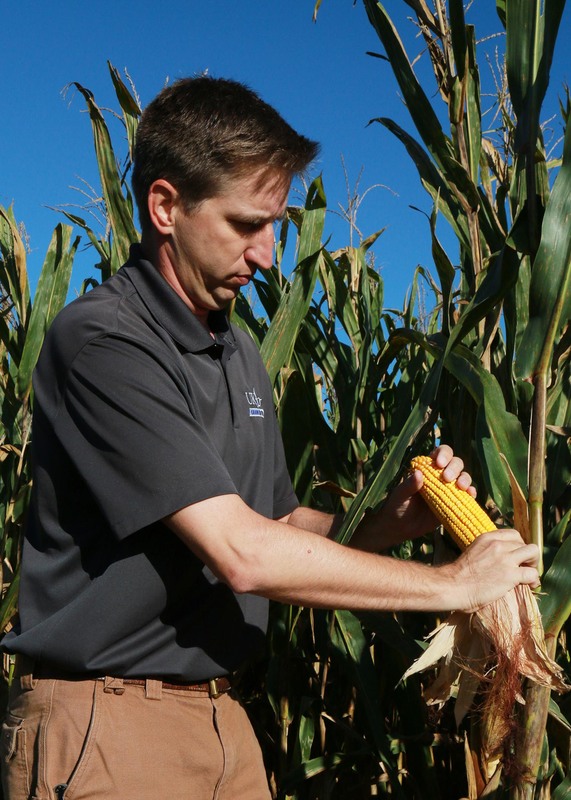 Lee came to UK in 2002 as a grain crops extension specialist based on campus where the majority of his research has been on corn, soybeans and wheat with ventures into other small grains where there has been an interest. A large part of his job has been focused on how to improve efficiency; increasing yields without spending more to get there. His position takes Lee across the state at least 60 percent of the time to help farmers with issues or in educational efforts through workshops and field days. He credits the skills he learned in FFA, 4-H and Farm Bureau youth programs as being most beneficial to him now on a day-to-day basis. Where did the idea of the Grain & Forage Center of Excellence originate? The idea really came from grain farmers. They recognized and appreciate the work that has been done over the years in this state. I came into a really good situation here 14 years ago where the University folks were all working together. But as the farmers were looking at the work being done at Princeton, they asked what we at the University could do to remain relevant in their challenges in moving forward. That’s where the conversations got started and from that, the concept of the Grains Center came about. The Kentucky Agricultural Development Board gave us a grant for $15 million which will largely go to improve facilities at Princeton. Anybody that goes to Princeton to learn or to work should benefit. The Center has gotten a lot of attention and support. What makes this project so important? It’s important for many reasons. First, it’s important because it’s an idea farmers had to begin with. Our farmers in Kentucky are, by in large, extremely smart and extremely progressive. They recognize their limitations in their fields and operations and they recognize that they want to improve those. I think their ability to be honest about their strengths and weaknesses really allows us to work well with them. However, we continue to face that tension between trying to produce more to feed more people; to feed more livestock and do it in a way that we minimize our impact on the environment. Many times in the past, those two things have largely been separated from one another. As we move forward, we’ve got to do that together. We need to understand what practices help us improve yield. We need to identify if there are practices that are causing concerns and issues, and we’ve got to fix those. I think if you look at where farming is headed over the next 15 or 20 years, the infrastructure that we are going to be able to put into this Grain & Forage Center of Excellence and the expansion of acreage will allow us to stay at the forefront of those issues to help our farmers be successful for another 20 or 30 years. How do you view the changes in our agriculture environment over the last 20 years? Kentucky farmers have historically had cattle, tobacco and grain crops but for those who recognized that they had soil types and situations that were conducive to row crops and as tobacco started to shift out, in some areas a lot more focus was put into those row crops. Now, we have seen some shifting in terms of whose growing tobacco and the concentration of those acres and as that’s happened some farmers decided they would try their fortunes in corn and soybeans. We have seen increases in those crops although our peak corn production acres was realized in 1917. Frankly, there were a lot of acres in corn back then that shouldn’t have been. I also think, in talking with growers that have been around for a long time, when they grew up they did not place an emphasis on grains production. Today, for many farmers, grains is their primary source of income and is their primary focus. If you put corn, soybeans and wheat together, they’re on about 3 million acres in Kentucky and worth, depending on the year and yields, close to $2 billion in our farm economy so they are a major player from an economic standpoint and from an acreage standpoint. However, we recognized that if we are really going to honor what our farmers in Kentucky face, we need to include forages in that mix. If you look at grain and forages together we’re close to seven or eight million acres of the state in those crops. We have several forage farmers and researchers who joined our task force and they will help create a vision for forages with the Center of Excellence. As more people become further removed from the farm, how do you explain to them the importance of this Center and the importance of supporting such a project? We are so efficient at growing crops. We’re so efficient at raising cattle and producing milk and producing poultry that the average citizen doesn’t even worry about whether or not we’ll have enough food at the grocery store, they just know that we do. They don’t know all the complexities that go in behind that which has allowed us to get to this point. I think from one standpoint, everybody likes to eat so anything that we can do to improve agriculture ultimately benefits them. The other thing is everybody likes clean water and if we’re doing things that allows us to safely produce food, feed, fiber and fuel, and in a way that is protecting our water and our environment, everybody could be in favor of that. The thing that is often lost on the general public when they think farmers is, every farmer we’ve got in Kentucky, whether they are into cattle, dairies, poultry, forages, tobacco or row crops, they live on that land and work on that land. For the most part, when they think long term, they’re not thinking five years, they’re thinking the next generation; will their son or daughter take over the operation. And they’re looking at setting up the land in a way that it’s better than when they took it from their parents. What are some of the immediate goals and possible challenges coming up for the Center? Our first goal is to cut the ribbon on the updated facility in less than three years and that’s a tall order. But our first challenge is, we are responsible for matching that $15 million KADB grant and we’ve got five years to secure an equal amount of funding. That’s something we’re very focused on have started that process. We’re also hoping to get several new faculty once the facility is updated and expanded. But as we go through the process of putting in an irrigation system and put in soil systems and work with growers, there are all kinds of little challenges that come into play but they all go toward our ultimate goal of helping to improve the lives of farmers. And when we improve the lives of farmers, we improve the lives of everyone.